This month, fans of a popular Sierra series bring us both an enhanced remake and an entirely new episode, while two popular freeware series get a new instalment each. Horror lovers can face a strange disaster in a large city, flee into a house even more dangerous than their pursuer or become a hideous monster from outer space. Those preferring lighter fare can enjoy an educational children’s game about mobile devices, a light-hearted quest for a train ticket or the tale of a mercenary pirate seeking to save his sister. Alternatively, you can pursue harmony among a spaceship crew, explore the wonders of the city of Loondon, or seek an old flame in a decidedly odd hotel. All these await you in this month’s round-up of releases from the freeware scene. If you’ve anxiously been awaiting a new Space Quest instalment since 1995, at long last there’s a brand new adventure to play this month. Vohaul Strikes Back is a fan game that has been worked on for more than ten years by a devout group of developers determined to release their own chapter in the popular saga. VSB takes place immediately after Vohaul’s defeat in Space Quest IV, allowing Vohaul to re-enter the storyline by being backed up to disk up by his minions and sent back through time, just before the destruction of the computer mainframe in which he was residing. Unfortunately for Vohaul, his underlings are the not-so-bright ape men (from SQ2), who restore him in a less-than-orderly fashion. Meanwhile, Roger Wilco is vacationing with his beloved girlfriend Beatrice Wankmeister on the planet Romanticon VII, but when their holiday is rudely interrupted, the two of them eventually make their way to the planet Radon, where Vohaul is currently hiding out. Visually, VSB is like a combination of SQ5 and 6, with the former’s pastel-painted backdrops and rich vivid colours, all done in a higher resolution than any of the original series’ titles. The sprites more closely resemble those in Space Quest 6, feeling somewhat out of place against the backgrounds. Despite the graphical mismatch, once you start playing it’s not off-putting in any way, and once you’re well into the story you’ll barely even notice the two contrasting styles. Combined with an excellent soundtrack and effects, slick point-and-click interface and clever, amusing storyline, there’s little to complain about VSB’s production quality. The only thing missing from the equation is character speech and narration, though the developers have stated their intention to implement this as an add-on at a later stage. Puzzles are well done, being challenging enough for even the most determined player but gentle enough for novices to make a reasonable amount of progress. VSB continues the parody style of humour found in all the other Space Quest titles, making it feel like it could be an original Sierra extension to the SQ canon. It all adds up to an enjoyable game that gets its hooks into you quickly and doesn’t let go. When compared to other modern titles, all it lacks are cinematic cutscenes, voiceovers and perhaps a slightly more coherent art style, but these are minor issues for a free game a decade in the making. With these things it quite possibly could have passed for a commercial game, and an enjoyable one at that. 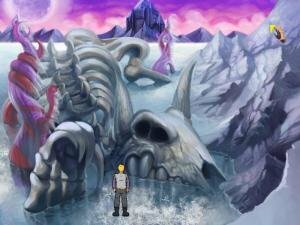 As it is, Vohaul Strikes Back is an excellent indie release, and one that no Space Quest fan should miss. Space Quest: Vohaul Strikes Back can be downloaded from the developer’s website. If you just can’t get enough Space Quest (and who can? ), you can also revisit Space Quest II in an enhanced remake. The original SQ2 really worked as both a synthesis and parody of several major science fiction films, from Star Wars to Planet of the Apes. Thrusting the mop of destiny back into his hands, the game featured lowly janitor Roger Wilco as the protagonist once again, while a humanoid being named Sludge Vohaul – who looks like an overweight Darth Vader with his face mask removed – sought revenge against Roger for foiling his galaxy-dominating plot in the first game. In the sequel, being the nasty piece of work that he is, Vohaul put in motion a plot to kidnap Roger and force him into a life slavery in the off-world mines on the planet Labion, to be followed by an even more fiendish plan to launch an army of genetically engineered insurance salesmen who take their motto “We won’t take no for answer” literally. Revisiting Vohaul’s Revenge in its original 1987 form now results in a game that is barely playable, with its horrid EGA graphics and a terrible soundtrack played through the internal PC speaker (which has to be emulated through DOSBox), while the keyboard controls and text parser are difficult to use and the main cause of frequent death. Needless to say, things haven’t aged particularly well in SQ2 Thankfully, the indie team at Infamous Adventures have turned their sights from King’s Quest to remake the game with overhauled graphics and sound, an interface redesign to point-and-click, and a few other crucial in-game changes for a much more appealing, accessible experience. The remake stays true to the original version, whilst improving just about every possible element of the game. The best part about the new version is… well, everything! It includes lush new VGA-inspired graphics, a great soundtrack and effects, and it rids the game of its painful keyboard reliance with its mouse-based interface. The latter significantly improves playability, but also makes the game significantly easier to complete and shortens the time spent playing it. A few other changes have been made, most of them cosmetic, but kept intact are the original dead ends, for better or worse. There’s still no auto save included, unfortunately, which is a bit of an oversight in a game that requires frequent saving with so many ways to die. Still, these are minor issues and for the most part Space Quest II is an excellent remake with a decent set of puzzles to solve and the same great humour as always. And best of all, it’s free! Space Quest II Remake can be downloaded from the developer’s website. By spilling the blood of the maiden most fair (or possibly the one with the most bears; legends are unclear) the evil wizard Mulduralm plans to rain down destruction on the kingdom of Saint CrabFloss. Unfortunately for the lovely Elsa, she meets both of the necessary criteria and faces sacrifice at midnight. But being as quick-witted as she is beautiful, all is not lost. Using sibling telepathy, Elsa calls on the aid of her brother, the feared pirate mercenary Captain Zaron. He won’t let his sister die if he can help it, and if risking hideous injury and death is required to save her, then so be it. This game from Studio Meristem is a tongue-in-cheek affair with graphics presented in a slightly stylised cartoon style, the characters having large round eyes and bodies slightly out of proportion with their legs. The models are smoothly animated, particularly Zaron’s running movement. The Captain also has an idle animation, where his arms restlessly twitch and his eyes constantly look around him. In conversations you get a close up of the character speaking along with the dialogue. Locations include Elsa’s lush forest home, a trackless desert and the forbidding castle of Mulduralm. The opening cutscene is fully voiced, but after that sound is limited to background noises suitable to the scene, such as waves washing the shore, and action effects like ringing a bell. There is also a tone that plays whenever the player accomplishes something to advance in the game. The game pays humorous homage to past classics, most notably King’s Quest, though Zork and Myst also feature. 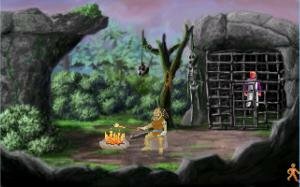 The most obvious Sierra influence is the sudden death scenes, though this game includes an Undo button, allowing players to take back the fatal action. Control is point-and-click, with an on-screen button or keystroke cycling through the various action cursors. A Zip mode is available, allowing immediate movement from scene to scene rather than waiting for the walking animation. Early on you acquire a spell book, with collected spells being selected later to perform as actions. 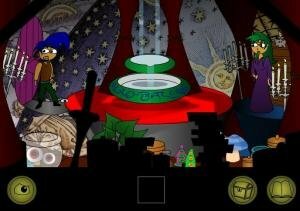 Puzzles range from simple inventory application to clever spell use and operating various mechanisms. There are two mazes, the large one including a welcome auto-map feature. You will also engage in simple arcade-style swordfighting and will sometimes need to act quickly. The combat sections have two difficult settings, with the Easy setting allowing them to be bypassed if you fail enough times. Captain Zaron and the Trials of Doom can be played online at the developer’s website. Indeed, a wonderful time for Space Quest fans! But where is Space Quest Incinerations, the third game that came out on 11 Jan? Also a very solid production as far as I can tell. As you say, it came out in January. This is the December round-up. No doubt the new game will be in next month’s. Takes a while to cover this many games. Yes Incinerations is on my list to look at for January. Speaking of Space Quest, special thanks to my colleague, Rob Murrant, for doing the write-ups on these this month. Saved me having to show my woeful ignorance of the series. Ah, for some reason I thought it was a random “what do we have here?” feature Never mind then, you are really doing a huge amount of work. Random? No siree. I scour a number of sources for adventure releases each month and then look at them all to determine what is worth covering. But the internet is a broad place to search and I can’t guarantee picking up all the good stuff. If you want to make sure a quality release comes to my attention, this very site’s Freeware forum is the place to do it. Author of the “disturbing piece of background music” from “The Visitor Returns” here…glad you liked my music. I’ve been a fan of adventure games forever, and a follower of this site for many years…my no. 1 resource for adventure gaming.